If you live in the 21st century, then chances are you’ve heard of Harry Potter. Admittedly, I am not a big fan of the boy-wizard. The story is entertaining, the movies are, for the most part, well-made, and the actors who represented the tale’s characters are quite enjoyable. But I’m more of a Tolkien/C.S. Lewis fan, and I can’t help but see where Rowling may have gotten her ideas from. 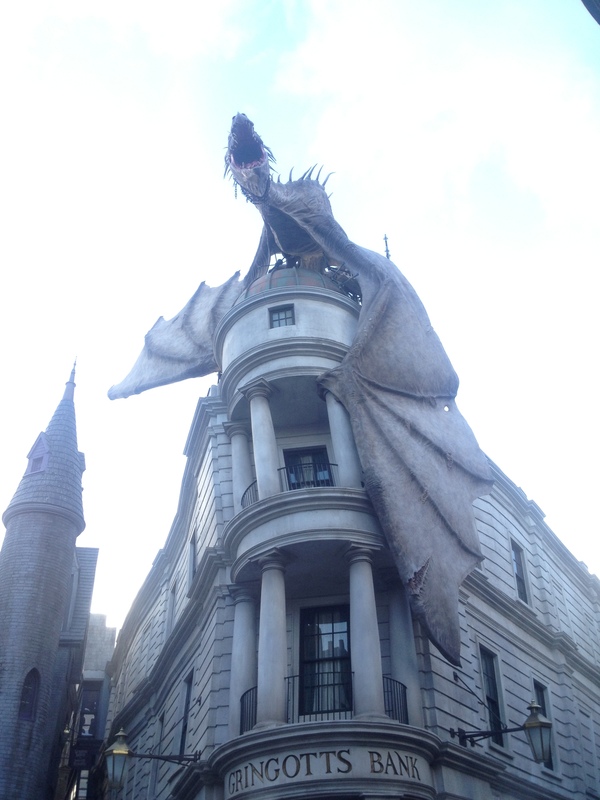 However, as a former witch in the original Wizarding World of Harry Potter, I can honestly say that Diagon Alley is insane. Like, I walked in, following the crowd of camera-snapping coworkers, and immediately felt my mouth drop. The detail, the size, the colours, even the pavement! All of it was so much more than what I expected. I am in no way trying to promote Universal. I enjoy working for the company, but I don’t work in the marketing department. 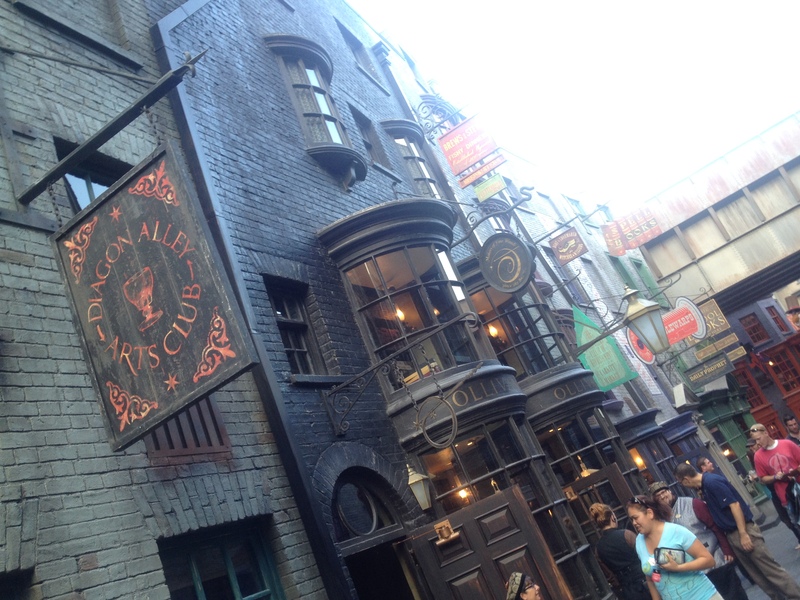 I’m writing this tale for the people who may have doubts about how “awesome” Diagon Alley is. The media went crazy with the coverage. I saw so much of this land before the Team Member Preview that I was pretty sure I knew where everything was and how it all worked and that I wouldn’t be surprised or impressed. NOPE. I sort of glided through the streets, trying to take in as much as I could, not because I was running out of time, but because I didn’t want to miss a single thing.There’s so much to look at, so many doors, corners, windows and sounds. (I won’t give too much away, but I was constantly looking up trying to locate the rolling thunder noise that passed over every few minutes or so. An absolute amazing effect that really immerses you into the world). The first thing I encountered was Celestina. I’m not too familiar with her background, but she is the favourite singer of Molly Weasley, as according to the blurb of info I read in the Universal Orlando Press Release. 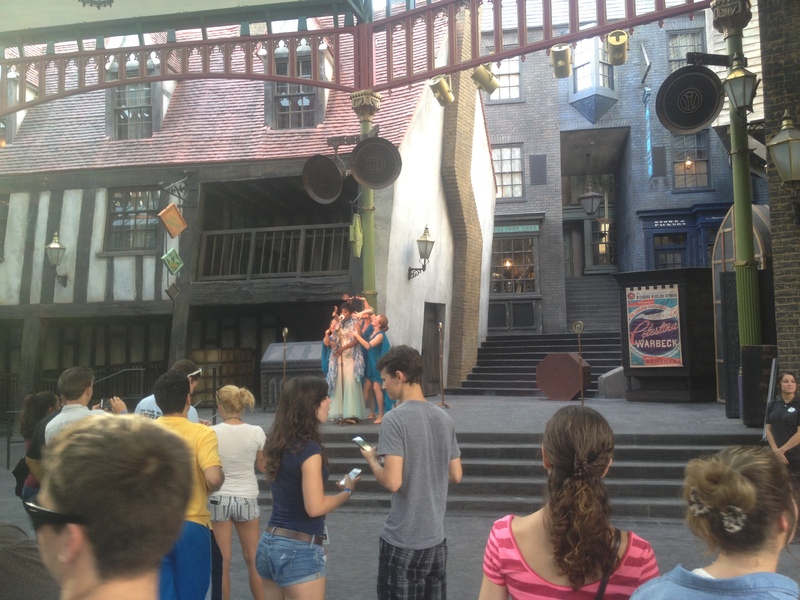 She and her troop of ladies come out to a well-designed stage, far better than the one in Hogsmeade, as it allows for actual room and shade for people to watch, and the actors to move. She totally blew me away with her performance. It was like a mix of a 1920s sound with the soul of Motown. Completely unexpected for an Orlando theme park, if you ask me. Of course, there’s more than one performer for Celestina, so some time later I watched a second Celestina come out, and she was just as extraordinary. Please don’t miss this show if you go! 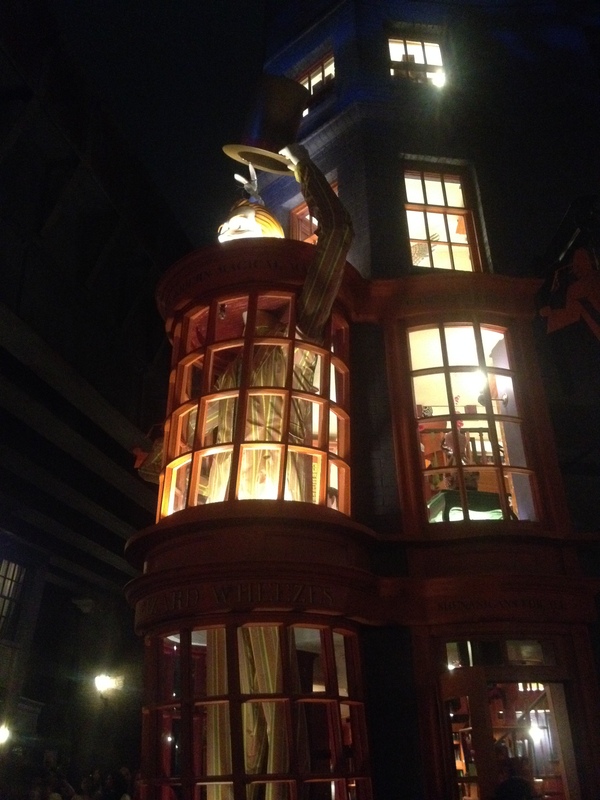 I won’t go into too much detail about the shops, seeing as I’d be here for hours, as I was in Diagon. I will share my favourite ones though, and give a few pointers as well. The shops are still on the small side, which I completely expected. 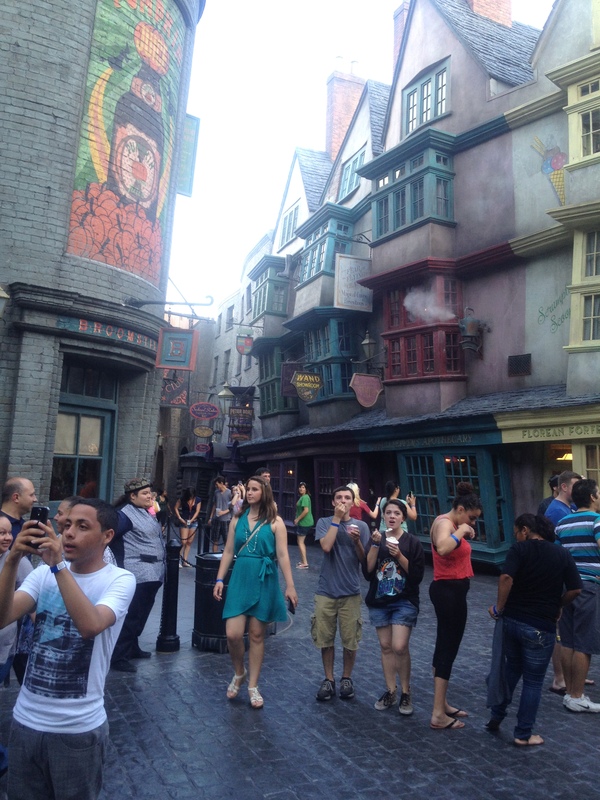 It gives the stores a more village-feel in a theme park setting, which isn’t easily achieved. However, the stores now have outside queues set up and ready to go, and most are covered. And, thank the heavens, there are more shops so products are split up into separate areas, versus all in one, making shopping a much more enjoyable (and less chaotic) experience. Wiseacres is hands-down number one for me. It’s like a cross of the Noble Collection and Dervish and Banges from Hogsmeade. I returned to that store before the end of the night just to take more pictures and contemplate skipping a few meals to buy some of the collectible items, like these wonderful armillary spheres! 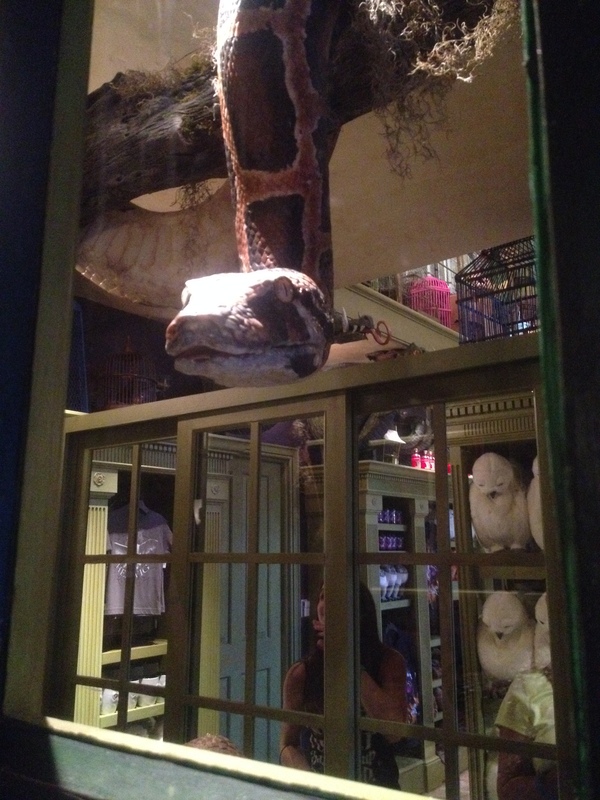 The Magical Menagerie is an adorable store. The wall of Pygmy puffs was too much cute in one section. However, there are so many things that move and make noise in this place, I’m sure I missed something, so spare some glances to the upper floors. Be sure to take a step outside to see the animals in the windows as well, since its quite hard to get a good look at them from the inside. 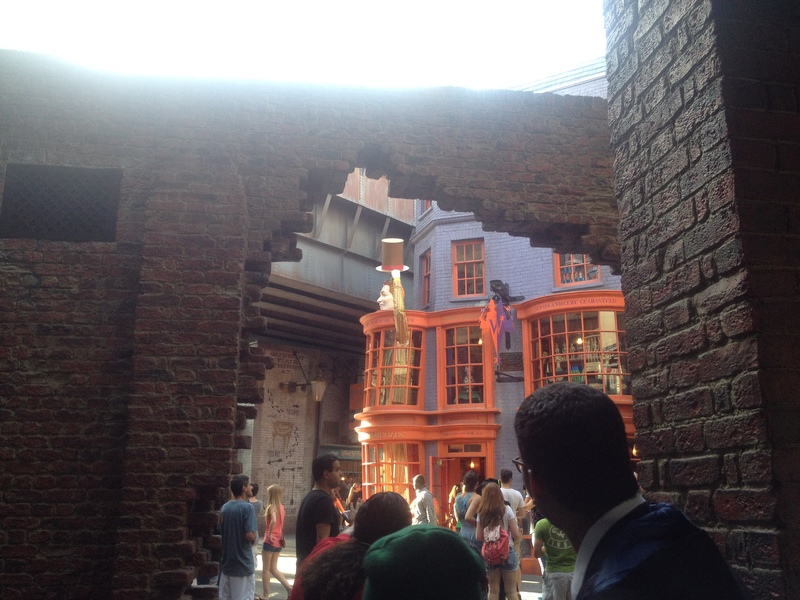 Ollivanders is now officially in Diagon Alley. The extension shop in Hogsmeade will remain open, as far as I know, seeing as the village will be quite busy once the Grand Opening happens. 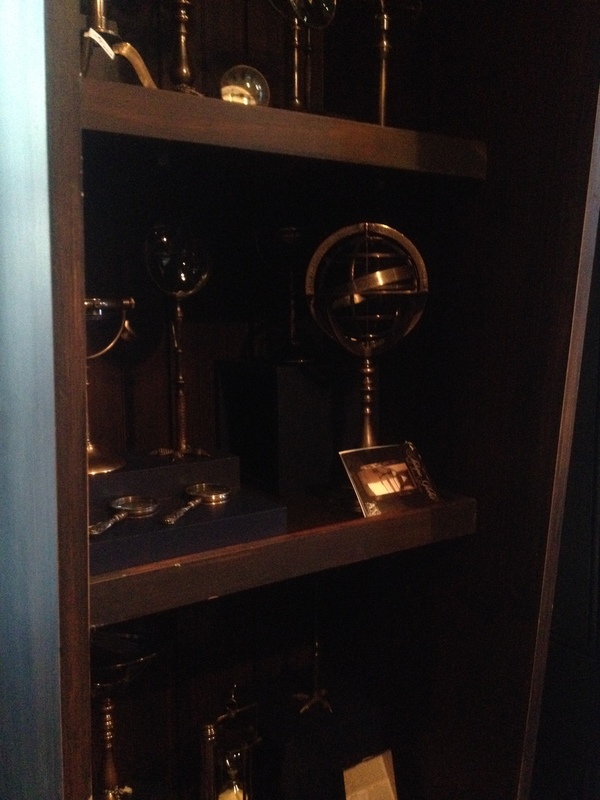 However, the interactive wands and the Ollivander Originals are located in the Diagon shop, and the wand-choosing ceremony is located in another part of the building. For those of you who don’t know, many, many Muggles mistook the Hogsmeade Ollivanders as the store, which was actually Dervish/the Owl Post. The interactive wands are more expensive but totally worth it. There are areas throughout the streets of Diagon Alley, Knockturn Alley and even Hogsmeade where witches and wizards can practice magic without worry of getting in trouble with the Ministry. Be sure to swish and flick and say the correct spell or it won’t work. SUCH AN AWESOME EFFECT. I saw a coworker doing a spell in Knockturn Alley and it was one of the most coolest things I’ve ever seen. I also started contemplating how important paying my power bill on time was and compared that to the price of an interactive Ollivander Original. 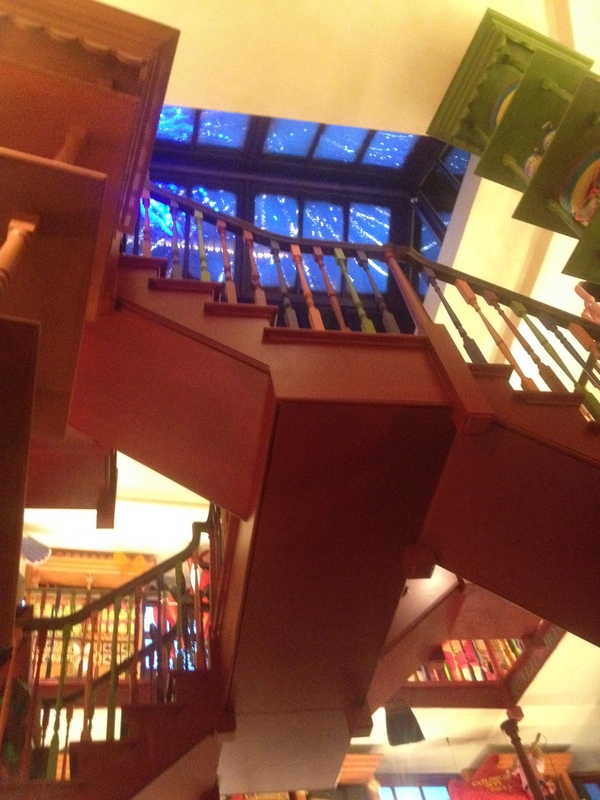 Weasleys Wizard Wheezes, the glory of the Weasley Twins Fred and George is the first shop you encounter when you first walk into Diagon, next to Quality Quidditch. I won’t go too in-depth on Knockturn Alley. I mention first that yes, it’s like walking into the night. The area utilizes black light on the streets and dim ones for the window displays to maintain the theme. One awesome thing Universal did was include A/C. The second you turn down the street by Florean Frotesque’s ice cream shop, the cool air is ready to greet you, and given the heat if Florida, you’ll welcome it with sweaty, open arms. Borgin and Burkes is the main store there and its got some interesting products in there. A friend bought one of the skull-dotted scarves, which was made of some silky material, way nicer than I expected 😛 The visual displays are pretty intense as well. And that giant wardrobe thing is in there, too. I’m sure it’ll be a big photo spot. 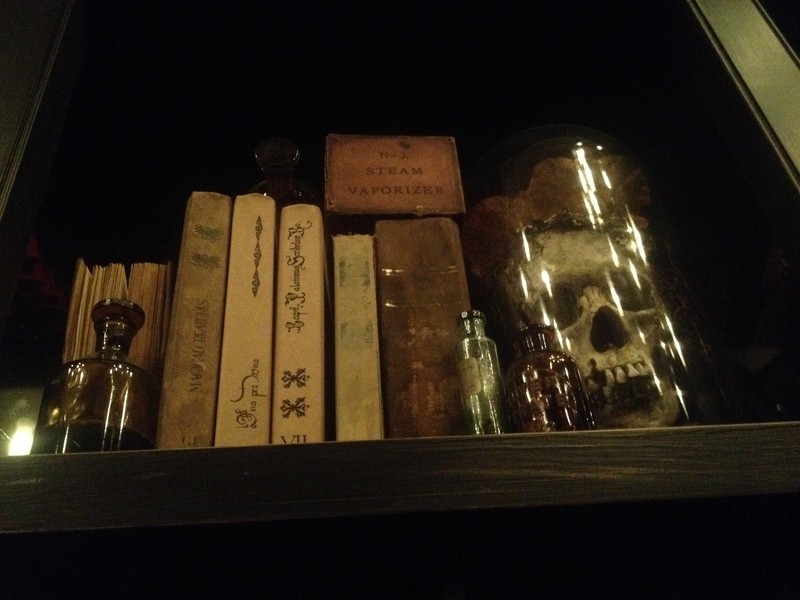 If you’re into the Death-Eater style, then I would definitely recommend hitting this place up. Now, to the highlight of the night. 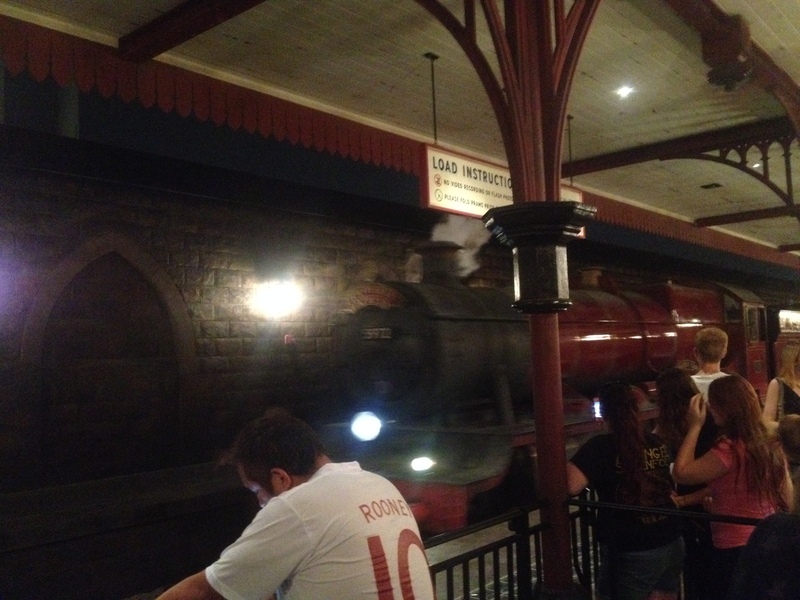 The friggin Hogwarts Express!! My expectations were all over the place with this guy. At first I was excited. An actual train? It actually moves?? There’s compartments?!? Totally awesome idea. Then I heard that the train only went one way, that there was only one show that played over and over. So not the case. The queue is massive for this attraction so they’re ready for the crowds. 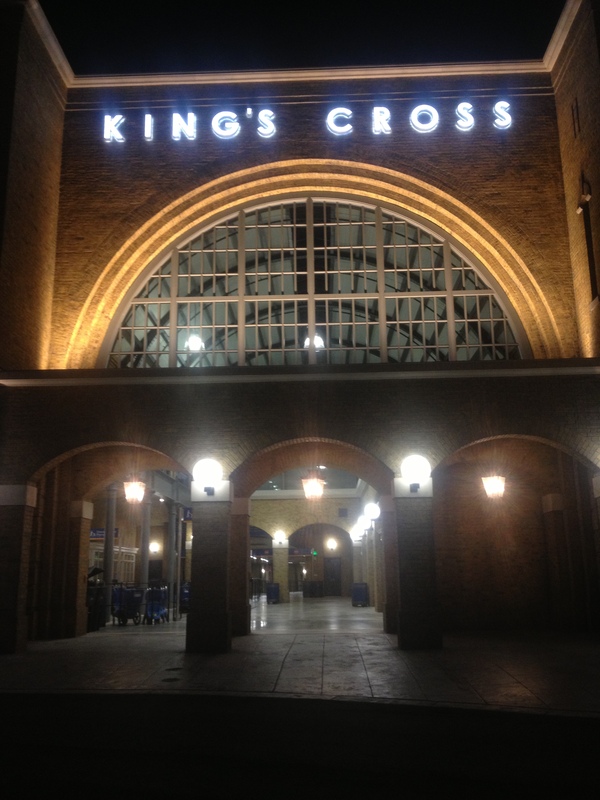 The design of Kings Cross Station, from what I hear, is straight on with the original. There was even a saxophonist playing by the Prams. Such a clever add-on. 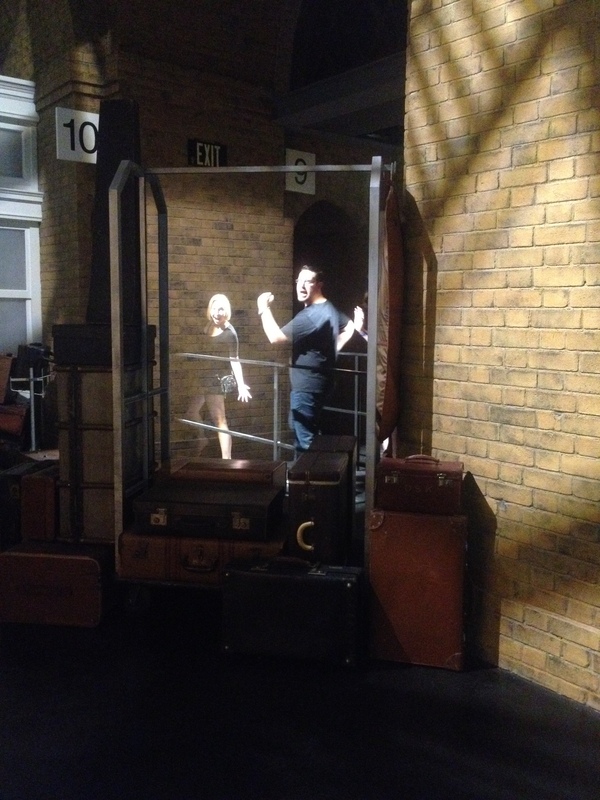 The pathway between Platforms 9 and 10 was pretty awesome, too. There’s a Porter there as well, so if you’re not sure where to look to watch witches and wizards pass through the magical wall, they’ll let you know! 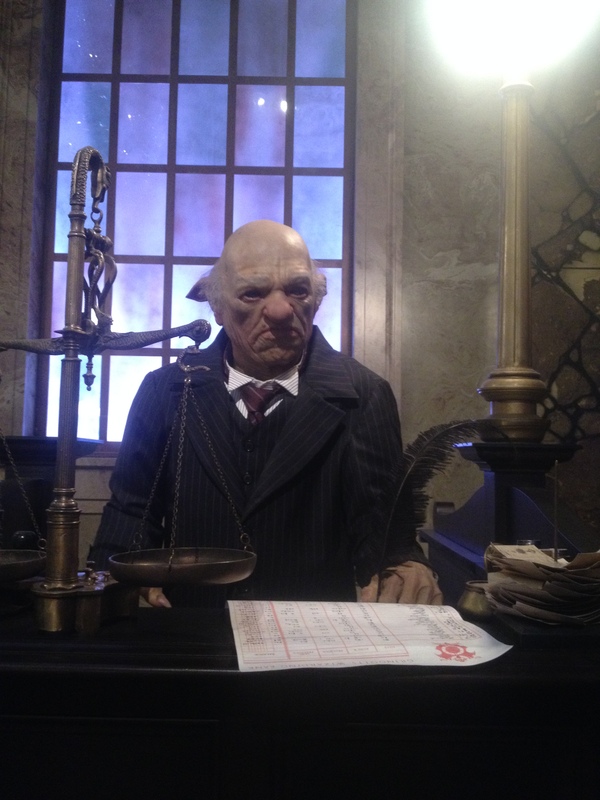 Unfortunately, the Gringotts ride was still in technical rehearsal during the preview, so I didn’t get to fight alongside Harry and the gang. We were able to walk the queue though, and it was GORGEOUS. 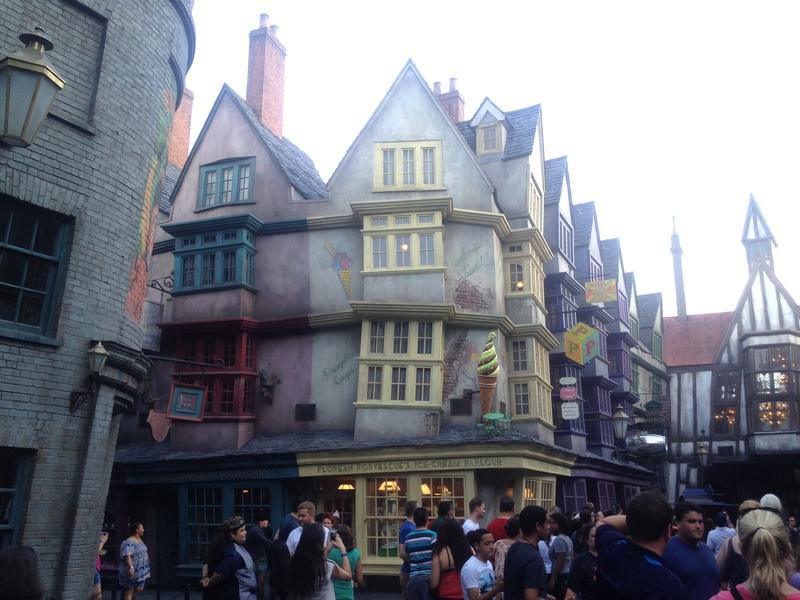 There’s more that I could mention, but I think I’ve covered a good amount of Diagon here. If you get a chance to visit, please do. If you think you can wait for the summer to end, I would. 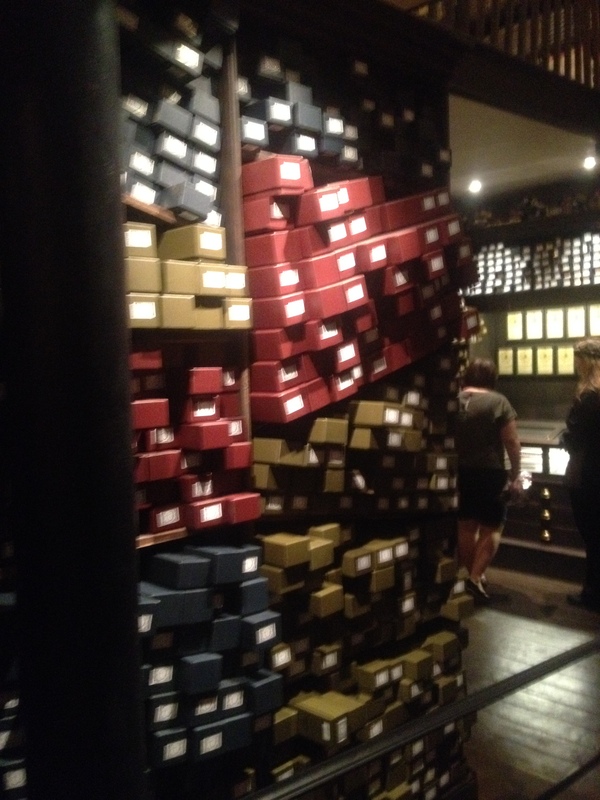 Not that I don’t want Universal to make metric tons of money, because that means more for me to go and buy wands with. 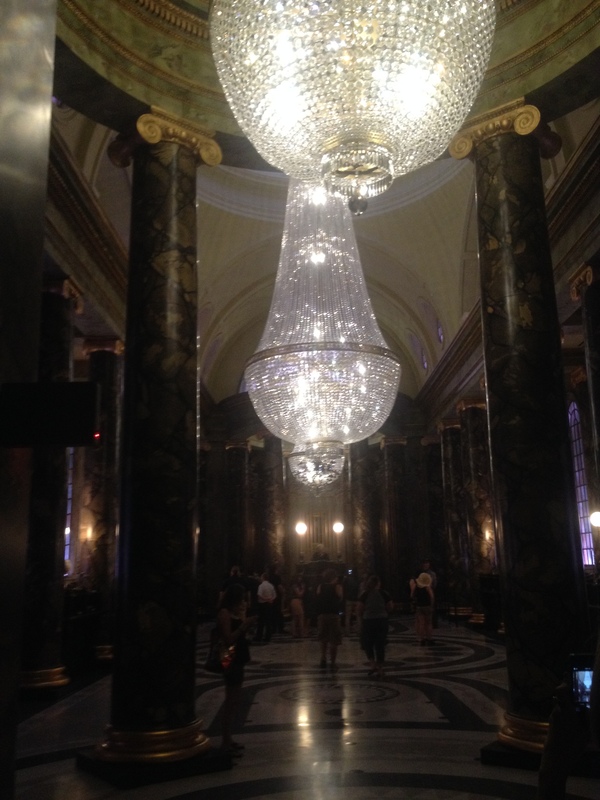 I just know that I had 3+ hours to explore the prime Wizarding shopping district, with the luxury of, at most, 5,000 other people. I had tons of room to move about without bumping into other folk, and without waiting for hours to walk into a store (although the ice cream shop had a line around the corner, so nope, there was no Butterbeer dessert for this witch). If you want to be able to enjoy the land in decent weather with fewer Muggles, than I say wait ’til Autumn or Winter. New is fun, but its July. In Florida. It can be pretty disgusting here come 1PM. 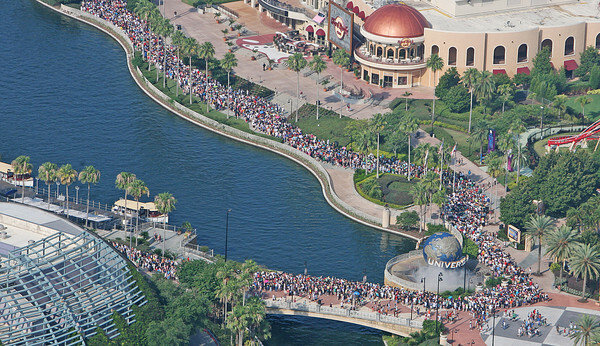 (The actual line for Hogsmeade’s Grand Opening. Um, no thanks).